The project starts with a couple of [Frank’s] PixBlocks. A processor is added to one PixBlock to serve as the controller for both after they are connected via the serial bus. A tilt switch, with a debouncing circuit, is connected to an IO pin. This tells the processor the orientation of the box and therefore which way the pixels should flow. Two switches set the duration of the timer in 15 second increments. A third starts the timer. When the box is rotated the pixels start flowing in the opposite direction. 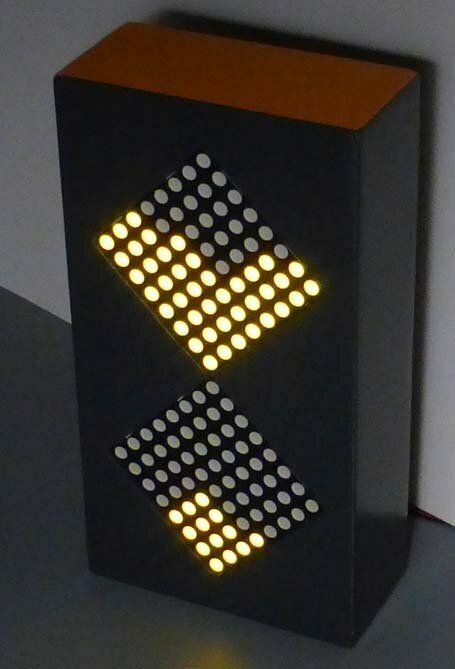 With code available on GitHub the system can be programmed for other effects such as changing colors, flickering, or even text display. You’ll agree this is a bit less intimidating than the MacGyver-ish kitchen timer we covered last year. As things get busy, whether it be an upcoming product launch, a pregnancy, or even the release of your favorite game (or movie!) sometimes it’s nice to have a little countdown timer. Not an app on your phone, but a tangible, physical timer to set on your desk. Which is why SevenSeg is such a cute idea. [Mohit] wanted to design something that was simple, but aesthetically pleasing — he’d seen free-form electronic projects before and wanted to give it a shot. What he came up with is pretty elegant! A seven segment display is connected via 1/32″ brass rods to the controller, a Particle Photon — which is kind of like a Teensy with WiFi for the internet of things. After putting a few resistors in line with the display, and a bit of frustrating bending of wire later, and SevenSeg was complete.